This Monday we met Keith Harrison, currently artist in residence at the V&A. He introduced us to his process-based public experiments that investigate physical transformations of raw clay using electrical systems. He is interested in the opportunities that the material offers, the unpredicted, making, manipulating, coding.. He performed clay-altered-musical instruments which are part of his lunch time interruption concerts. Keith discussed challenges of the Museum based residency and experimenting in public. A great insight into his practice and night at the V&A! Thank you James for arranging! Come and join Alt MFA in the launch of our future programme supported by a-n funding, with some events at Guest Projects this May. Bring an object, text, image or idea related to the theme - be it something by someone you've found to be provoking or inspiring or something from your own practice. Bring a snack to share as well! No need to book for the Open Meeting, just turn up and ring the bell that says Guest Projects. On March 15th we were invited to debate the current state of arts education at Res|Fest at the Courtauld Institute in central London. On the panel with Russell Martin from Artquest, Jane Sillis from Engage, Kathryn Welford from Yorkshire Sculpture Park, Paul Maheke, artist and ex-OSE associate, Emma Edmondson, TOMA in Southend, Alan Magee, artist and lecturer and Sadie Edginton and Nathania Hartley from AltMFA. Thanks to Jessica Akerman at The Courtauld for inviting us. Dave Beech talked to AltMFA this October about anti-work, and what could happen if post-capitalism was a reality. Last week Dave Beech shared his ideas on his new book about post-capitalism. He shared some history of the links between the artist, the ideal 'worker', aesthetics and labour. And showed us some different takes on what a world after capitalism might look like, as well as different theories around this. Dave Beech is a member of the Freee Collective with Mel Jordan and Andy Hewitt. This was another special session as part of our AN funded talks, where we have contacted 10 people who inspire or influence us, to come and speak/ run a workshop or hold a discussion on their way of envisioning the 'future'. 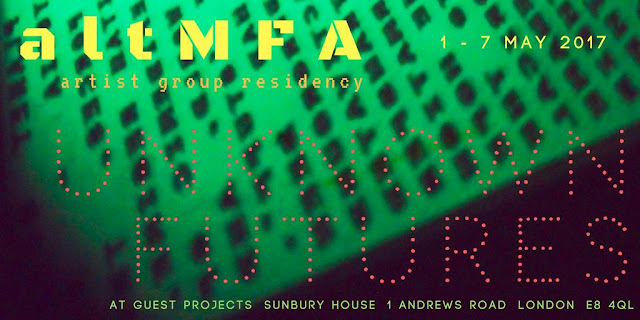 An AltMFA member, or a group of us in collaboration will respond to each session, which we compile in a publication and launch later in the year.